For many children, going to the doctor is a scary endeavor. As a parent, it can be challenging to calm a child who is anxious about their upcoming doctor’s appointment. If you want to help calm your child before or during their appointment here are some helpful tips! Children are comforted knowing that their parents are right by their side. 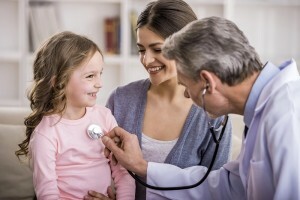 If your child is anxious about seeing the doctor, reassure them that you will be with them every step of the way. It can be scary for a young child to be led away from the waiting room by the nurse without their parents next to them. The hope is that they will eventually feel comfortable going back on their own after a few visits. Many children feel more relaxed if they have their favorite toy or stuffed animal with them during stressful situations. If your child needs to get a shot, allow them to squeeze a teddy bear. In a room that is filled with foreign objects, it is often beneficial for the child to have something they can relate to. Many children are afraid of the doctor because they are afraid of the unknown. It is easy to become anxious about something when you don’t know what to expect. It helps to put your child at ease; it could be beneficial to role play and show them what a typical doctors appointment consists of. For example, pretend to be the doctor and show them how a doctor will look into their ears and mouth. By doing so, they will feel more prepared when they have to go to their appointment. This entry was posted on Friday, September 21st, 2018	at 11:23 am	. You can follow any responses to this entry through the RSS 2.0 feed. Both comments and pings are currently closed.